We spent all of June and the beginning of July this year abroad, mostly in France with a brief excursion into Germany. It was a splendid holiday with bits of work thrown in – three gigs and some instrument collection too. I meant to keep a blog through the trip, but in the end I didn’t have access to wifi reliably enough, so this is the first episode in what is more of a retrospective, including some notes I made at the time. Our first appointment was at the incredibly romantic castle of Puivert, way down south in the Languedoc-Roussillon. A view of Puivert in the last light of the day. Puivert was featured in The Ninth Gate, starring Johnny Depp. It’s in pretty good repair – the keep especially – and has a dramatic profile suitable to its film role of the devil’s castle. 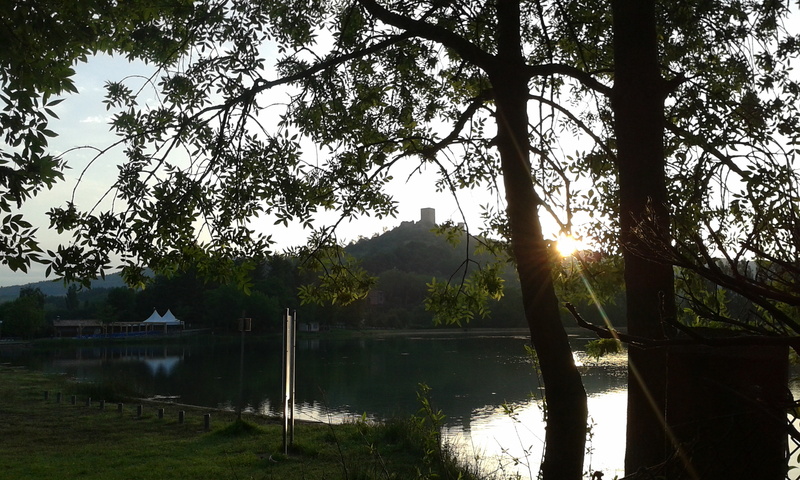 The castle, from the campsite soon after dawn. 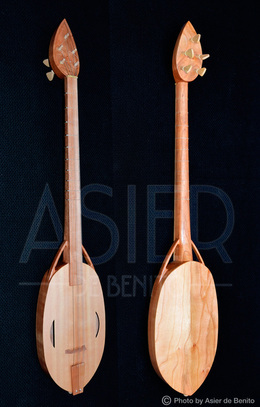 The Puivert festival (properly ‘Les Rencontres Internationales de Lutherie et Musique Médiévale de Puivert’) started life as a meeting of luthiers specialising in medieval instruments. 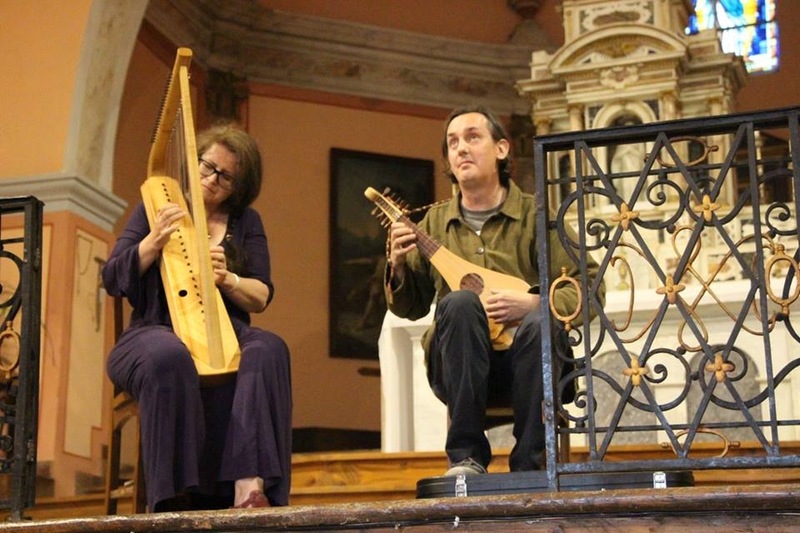 This is its third year and it has been growing all the time with luthiers, musical performances, talks and presentations, and living history. We were involved on three levels. Firstly, on Saturday afternoon, I presented a talk – in French – on the Chansonnier du Roi and its links to medieval Greece. This is the manuscript we mined for all the material on our CD Music for a Medieval Prince. I recently wrote about the manuscript as part of a chapter on a forthcoming handbook of medieval Greece (published by Brill, should be out next year!) and it had been a major challenge for me to put together this presentation in French! At first, it looked like no one was going to turn up, but by five minutes in there was quite a crowd, so I had to start all over again… after that it all went pretty well. I think the French were able to understand me! 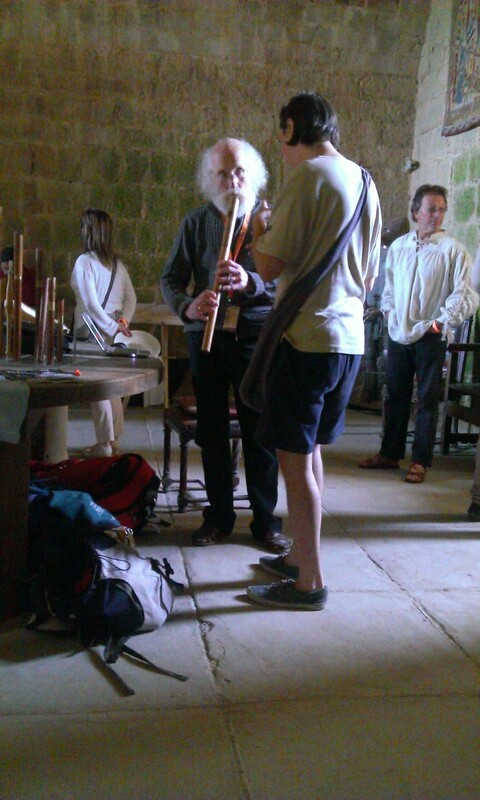 and Paul joined me at various points in the presentation to present music from the manuscript. 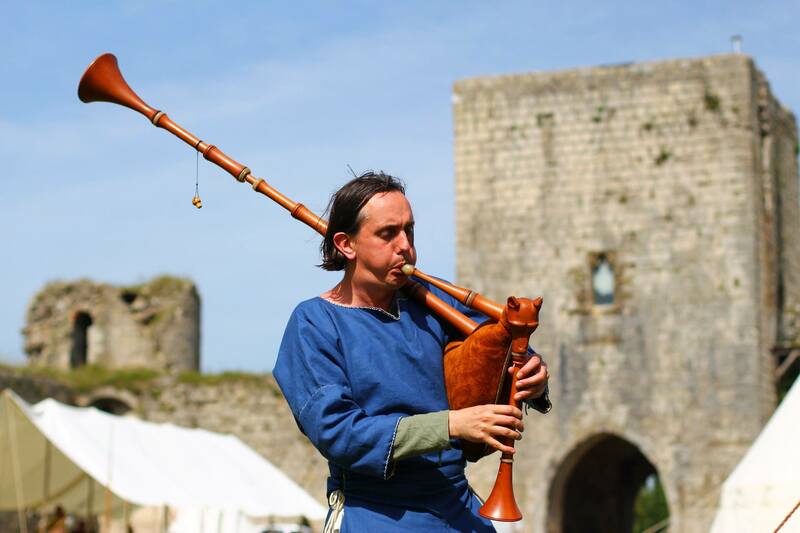 I guess one of the strangest things for us was playing our music without our medieval ‘superhero outfits’ on – just in modern civvies as it were… We are very used to performing in medieval garb, so this was something new. It was the same for the concert on the Saturday evening, our second involvement. 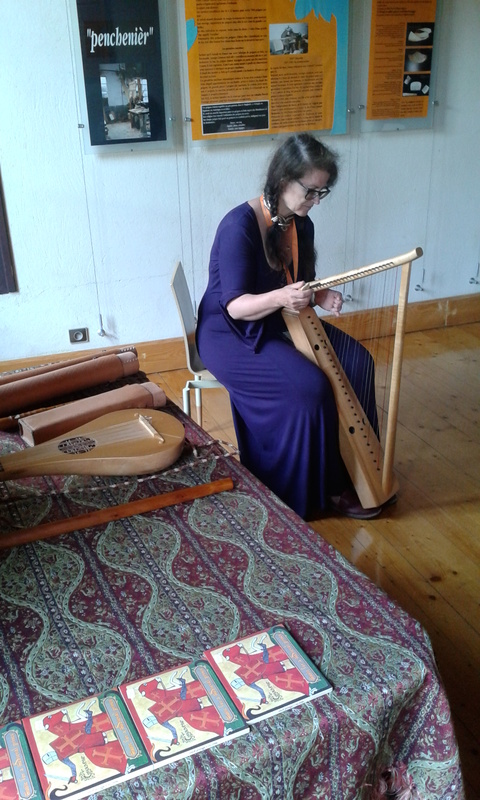 But this too went well – we presented a selection of thirteenth century music, with an estampie real, two cantigas, a ductia plus Miri it is, and Chanterai por mon corage. The concert took place in the chapel in the village, which had very lovely acoustics and it was a pleasure to perform there. 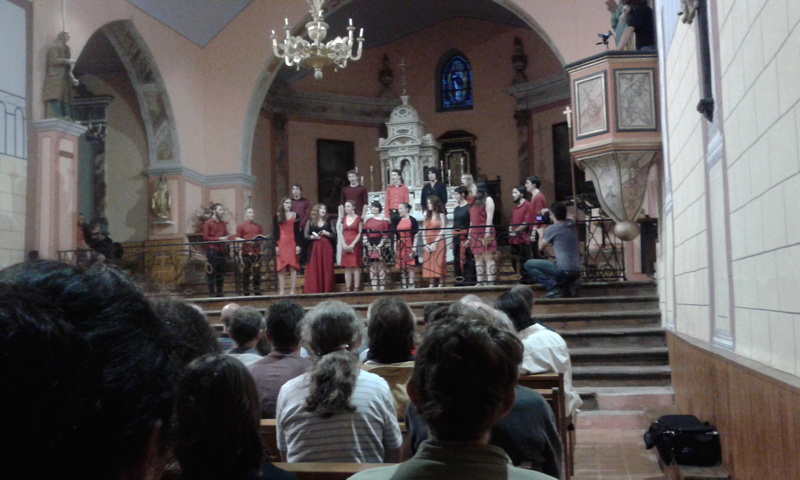 We also very much enjoyed other contributions to the evening – notably Hortus Deliciarum, a choir of students from Montpellier who presented truly delicious motets and liturgical music. 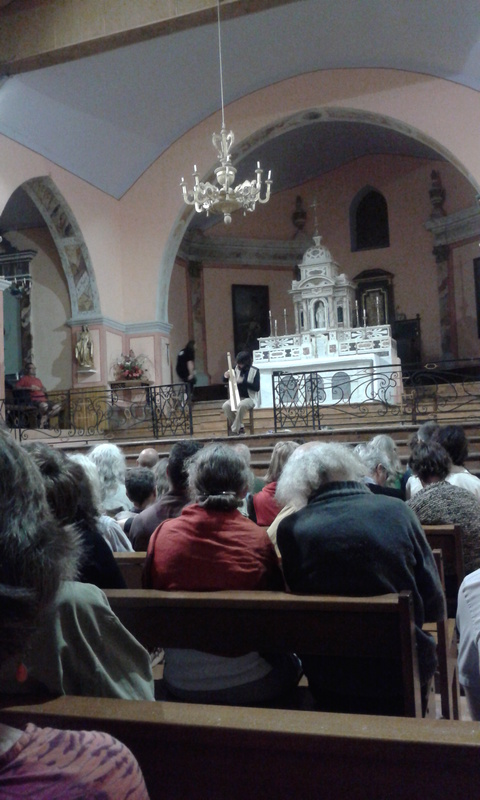 We also at last got to hear Vicente La Camera Mariño playing so sweetly on the lyre and on the harp. Our part of the concert seemed to go down well and it was a great evening all round. As our final contribution to the festival, we at last got into our outfits, set up our awning on the castle lawn and played our way through the afternoon. This was lovely – the weather was perfect, and people sat around and soaked up our sounds. 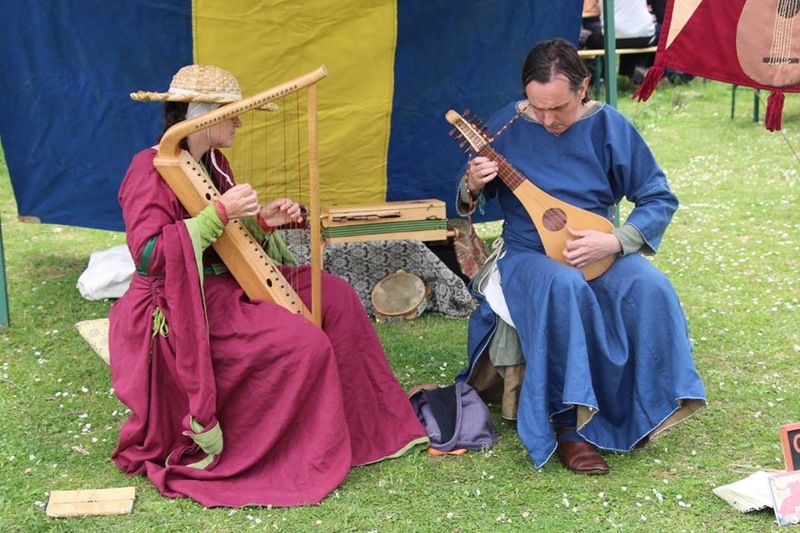 We got to meet up with many of the singers from Hortus Deliciarum – they were keen to learn Brid one brere and we worked on the song together. This entry was posted in Diary and tagged france, medieval music, minstrels, Puivert, pyrenees, rencontres international, trouvere. Bookmark the permalink. ← ‘Tudor Dance’ is out!